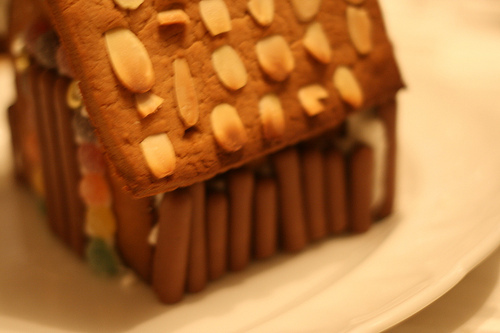 I have ALWAYS wanted to make a gingerbread house. This is the first year I’ve ever been brave enough to try it, and I was surprised by how easy it was. 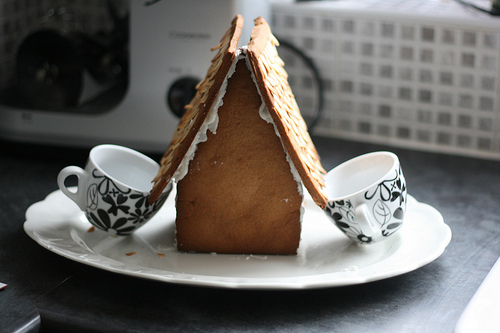 Getting the house to stick together was a pain in the arse, but everything else was very simple. 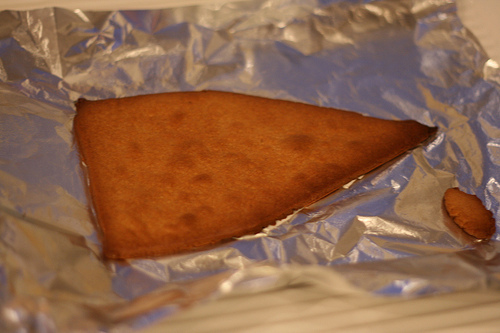 It turned out beautifully and tasted very nice too; the only problem was that it was quite hard. Definitely an “eat with a cup of tea” recipe. It’s from, as always, the ever-wonderful BBC Good Food website. 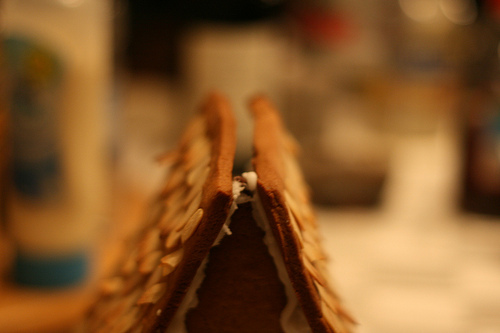 Start, obviously, by making your gingerbread. 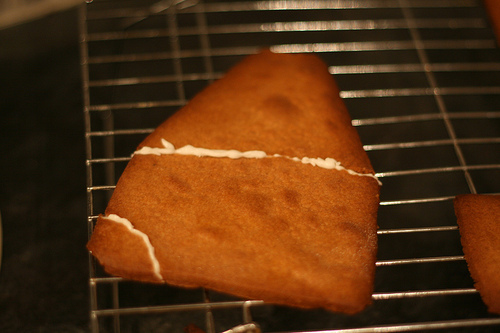 Pre-heat the oven to 200C or 180C if you have a fan oven. Put the butter, sugar and syrup in a pan and melt them. The easiest way to get the syrup in the pan is the make everything wet; wet the spoon before you put it in and have a bowl of water for you to dip your finger in to to help you push the syrup off the spoon and into the pan. Golden syrup gets everywhere but this is the easiest way to keep it under control. 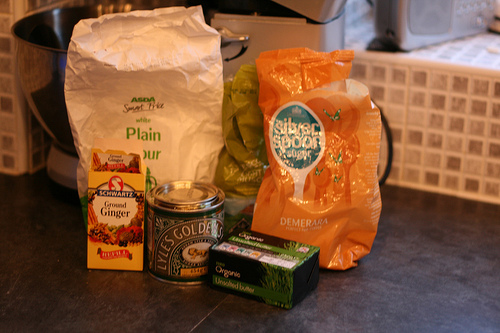 Then mix the flour, bicarbonate of soda and ginger together in a big bowl and stir in the syrup and butter. 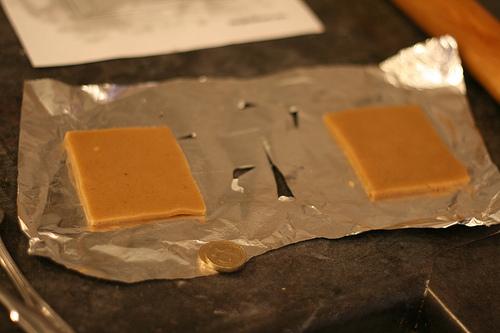 It should make a smooth dough the colour of coffee icing; if not, add little splashes of water. Download the template at the bottom of this page and print it out. Put a sheet of baking foil on your work surface, put a quarter of the dough on top and roll it out until it’s about as thick as a £1 coin. 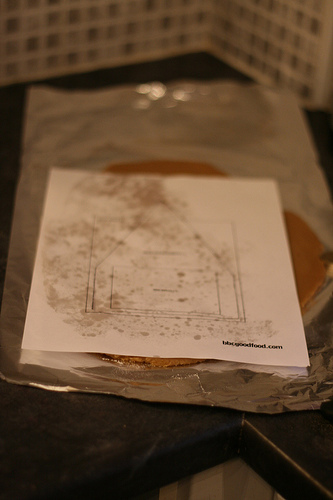 I didn’t have any baking parchment so I used foil, which worked just as well. Now it’s time to cut out the shapes. I did it by laying the template on top and piercing the angles with a knife, making small cuts to make sure I get the angle right, before removing the template and joining them together. 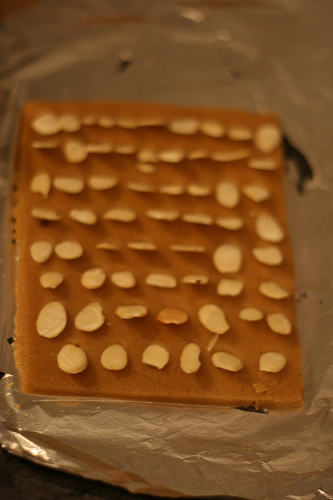 And this is after baking. 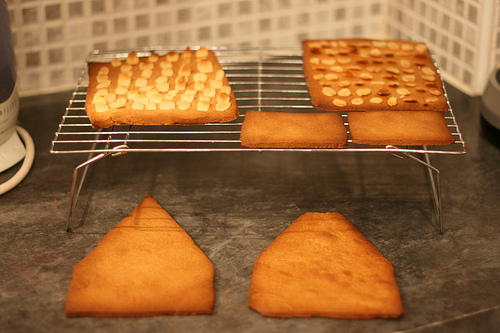 To make extra shapes, just roll out the dough and do the same again. 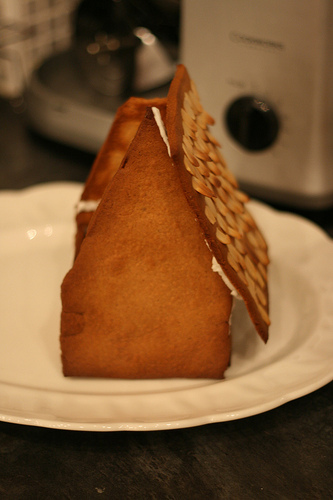 I recommend cutting out and the walls first and doing the roof whilst they’re baking. 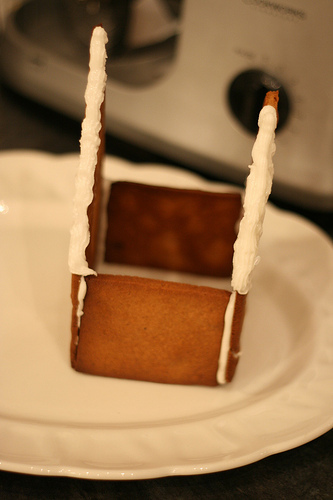 When the walls are cut out, slide them onto a baking tray and bake in the oven for about 12 minutes. Yes, the bottom right looks like it’s missing a point. It is. I dropped it, that bit fell on the floor and the dog scarfed it before I could get to it. It broke in three pieces but you can’t quite see there. Sigh. 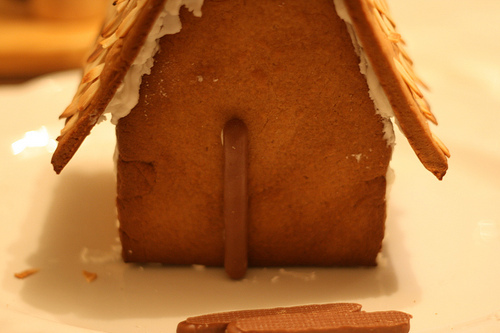 I left mine for a few hours in the kitchen; however, it felt apart as soon as I tried to glue to roof tiles on. 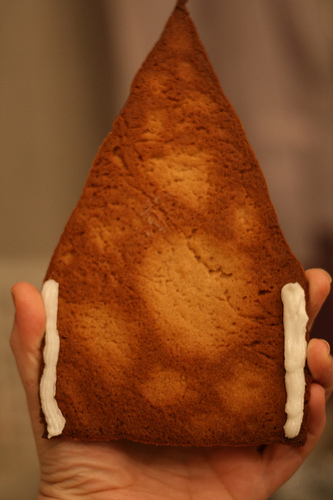 I ended up leaving it overnight in my garage; my garage is very very cold and cemented the icing and the walls together; however, I think it also made the gingerbread very hard. 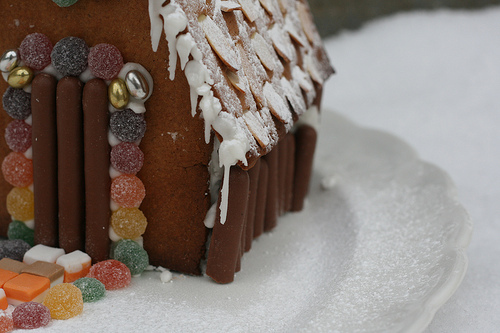 When the roof is dry, you can get to the fun bit; decorating it! 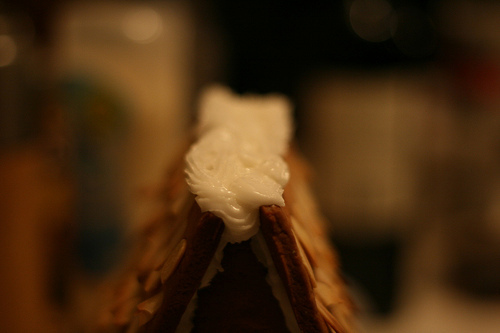 My roof tiles didn’t quite fit together at the top, so I decided to try and cover that up with a thick squirt of icing. Like there was a thick gathering of snow at the top of the house. That was the look I was going for, anyway. And stuck it to the front of the house. And then did that with two others. I stuck big gems surrounded by jelly tots on the front and back to act as windows, and did a layer of jelly tots above the fingers on the back to make it pretty. I was almost finished. 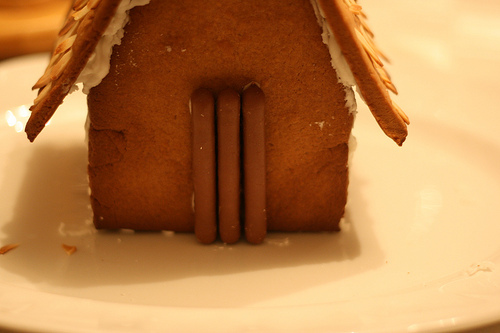 I had to do the icicles now. This was the scary bit. 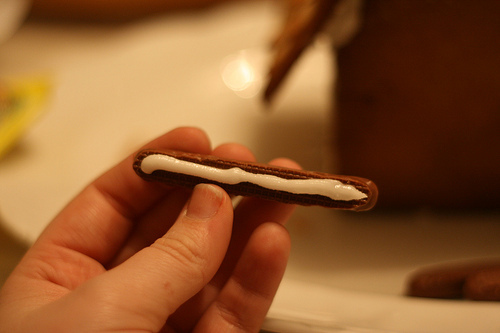 I changed nozzles so that I had a very, very small nozzle on my icing gun and followed the instructions on the recipe; hold the nozzle at 90 degrees to the roof, squeeze out a pea sized blob of icing and then, still squeezing, move the nozzle down before sharply letting go and pulling away. 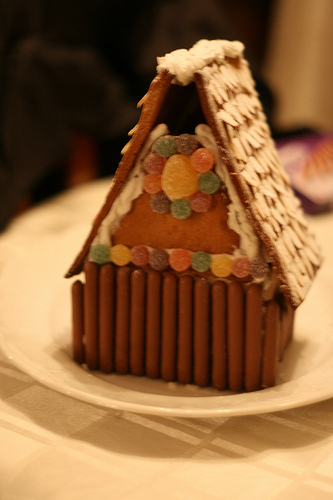 This is time consuming, tricky and nerve-wracking, but it does look good when finished. 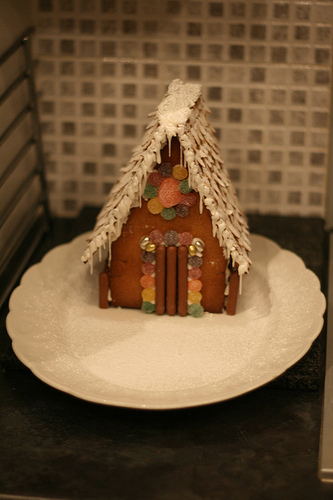 I then moved the house to where I wanted it on the plate, put some icing in a sieve and dusted it over the top to give the roof a snowy look. 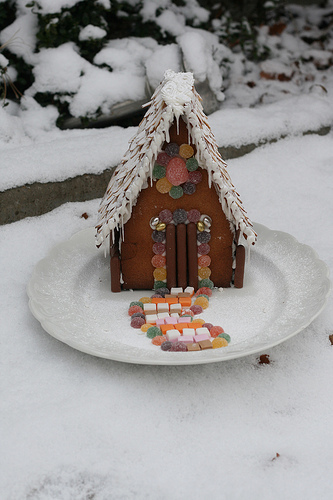 The final touch is to lay a path of sweets to the door, using jelly tots and dolly mixtures. And then sit back and marvel. I so want to go to a house like that. Like I said, eating it was a bit tough. But it was so pretty, and everyone was really impressed by it. 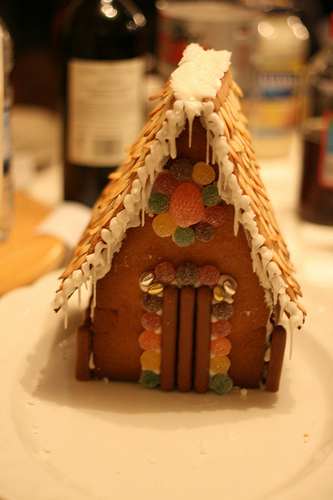 I’d love to make something like this with kids; I imagine they’d really enjoy it and it’s not that difficult. 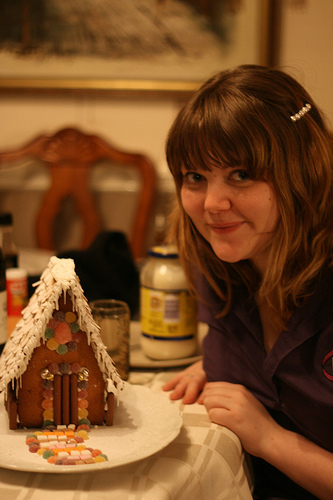 There’s a Flickr photoset of my making it here. 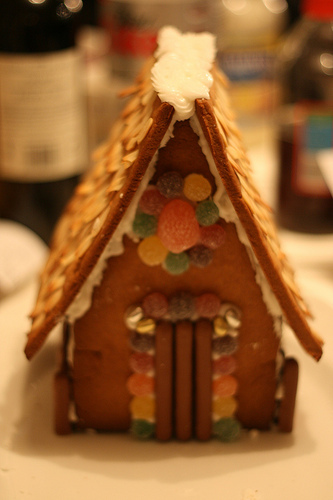 If you do make it, please share pictures; I should have a gallery of gorgeous gingerbread houses. 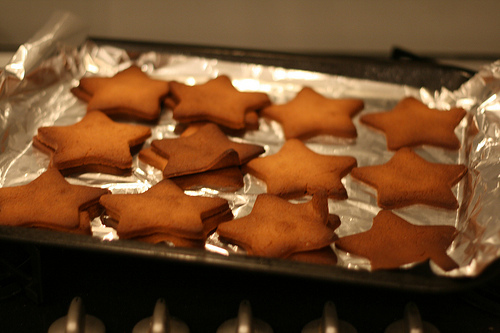 Plus, I was able to make star biscuits with the leftover gingerbread.